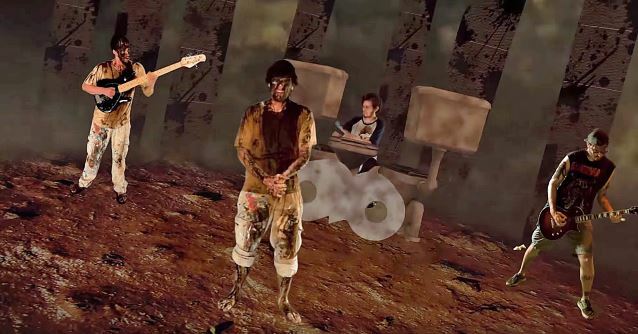 The official video for "Shitting Mud", a re-imagining of SLAYER's classic song "Raining Blood" performed by STATE OF THE FART, the musical project brought about by the world's most impressive handfart architect, Guy First from Israel, can be seen below. The track was recorded by Ran Yerushalmi and mixed by Yoni Menner of the band WALKWAYS. Written by Jeff Hanneman and Kerry King for SLAYER's 1986 studio album "Reign In Blood", "Raining Blood" is one of only three tracks on the LP that is longer than three minutes, having a running time of four minutes and seventeen seconds. The song closes out "Reign In Blood" with a minute of rain sound effects. Eccentric singer, songwriter and pianist Tori Amos covered "Raining Blood" on her 2001 album "Strange Little Girls". SLAYER guitarist Kerry King later admitted that he thought the singer's version of the track was odd. "It took me a minute and a half to find a spot in the song where I knew where she was," he said. "It's so weird. If she had never told us, we would have never known. You could have played it for us and we'd have been like, 'What's that?' Like a minute and a half through I heard a line and was like, 'I know where she's at!'"